What a VMworld this has been for VSAN. The building momentum of this product is awesome to see, especially for those of us who have been evangelizing it from the beginning. The conversations have changed significantly this year. Previously it was all about “Why should I use VSAN?”. Now that the benefits of VSAN are obvious, the conversations this year were more technical and more around enablement, e.g. “How would I achieve X with VSAN, what are the points I need to consider when I use VSAN for Y, etc?”. As I mentioned in a previous post, this year I presented two technical sessions at VMworld 2016 in Las Vegas with my buddy, Paudie O’Riordan. 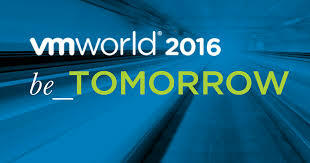 Both recordings are now available, even to those folks who were not registered for VMworld. The first session was VSAN Day 2 Operations, covering monitoring, upgrading and troubleshooting. The second session was Conducting a successful VSAN Proof of Concept, which I’d delivered at previous VMworlds, but which has been updated for VSAN 6.2. The other thing I want to call out is the success of the VSAN Hands On Lab. Kudos once again must go to John Browne of GSS in Cork in putting this together, and to the HOL team for all their help. VSAN was once again the #2 HOL at this year’s VMworld, with a total of 772 labs taken. If you are interested in “kicking the tires” of VSAN, and going through some of the common workflows, check out the HOL on VSAN. One additional point, there was a VSAN beta announcement soon after VMworld. Duncan has some further details in this blog post. If you are interested in any of these upcoming features, be sure to participate in the beta. Finally, Paudie and I will be re-running our VSAN Day 2 Session in Barcelona. If you are attending VMworld 2016 in EMEA, we’d be delighted if you attended our session. Let me if it gets uploaded post VMworld Barcelona. If not, I will see if I can add it to youtube with some voiceover, and I’ll add the link here. I have been looking into the new features in the VSAN beta and I know one of them is the ability to have local RAID plus mirroring for a Stretched Cluster which is something we spoke about sometime ago. On the subject of Stretched Clusters do you know if we will be able to set Preferred Site at the VM level – pretty important I would have thought. Also do we know if the iSCSI target will work with vSphere hosts and if it will work in a Stretched cluster?